Welcome to our Via Murano® online experience. We are so glad you have stopped in for a visit to find out about us and to do a bit of shopping. Here at Via Murano® we strive to satisfy our customers by continually launching quality merchandise and providing excellence in customer service. Our mission is to continually develop new, innovative and high-quality products to enhance your jewelry making. Our goal is to bring forth the best creative elements at affordable prices to designers worldwide. Our distinctive jewelry findings include SNAPEEZ® "The Ultra Secure | No Solder Jump Ring”, The Twisted Tornado Crimp® Secure | Easy | Trusted allows you to "Crimp with Confidence", Synergy® Beading Wire, and DuroPlate Chain and Findings. We feel that new product development is essential. We create products that allow you to excel in your jewelry-making endeavors. SNAPEEZ® II UltraPlate® The Ultra Secure | No Solder Jump Ring allows you to attach charms, join wire-wrapped pieces, connect earring findings, and link your chain to clasps. You will find a million uses for SNAPEEZ® in your designs. SNAPEEZ® II UltraPlate® are available in 11 designer finishes and 6 different round sizes and 3 different oval sizes. Our original SNAPEEZ® are available in sterling silver, 14kt gold-filled and 14kt rose gold-filled and they come in 4mm, 6mm 8mm and 10mm sizes. The Twisted Tornado Crimp® Secure | Easy | Trusted. It is a secure and easy-to-use crimp that is truly beautiful. The Twisted Tornado Crimp® is a small component that makes a huge difference in the overall beauty and security of your work. The Twisted Tornado Crimp® UltraPlate is available in 6 designer finishes and .019 and .024 sizes. Our Twisted Tornado Crimp® Original is available in sterling silver, 14kt gold-filled and 14kt solid gold and .019 and .024 sizes. 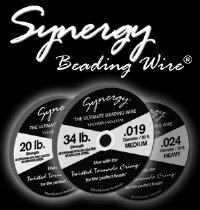 Synergy Beading Wire® takes the guesswork out of choosing the right beading wire. All Synergy Beading Wire® is 49 strand nylon coated stainless steel, and they are Manufactured American™ by Via Murano®. We have engineered Synergy Beading Wire® to be the strongest and most supple beading wire on the market for durability and elegance in your designs. It's strong! It's supple! It makes stringing easy! Available in .015, .019 and .024 sizes. 30 foot, 110 foot, and 1000 foot spools. Use with our Twisted Tornado Crimp® for the perfect finish! UltraPlate® and DuroPlate™ are our trademark plating processes.They result in a plated surface that is many times the thickness and significantly more durable than the industry standard used on most fashion jewelry components. Premium design elements with Ultraplate® and DuroPlate™ are high quality products that allow for the same look, feel and integrity of expensive sterling silver and/or 14 kt gold-filled. Superior components at a lower cost to you translates into affordable products for both you and your customer. Choose UltraPlate® and DuroPlate™ and experience the revolution in jewelry components. The Internet has made us a global business. Our customers delight in their purchases, and we find that extremely rewarding. We are always just an e-mail away should you have questions, special requests, comments or suggestions. You can e-mail us at sales@viamurano.com. See what's happening at viamurano.com and share your favorite products with your friends through social media! Thank you to all our current and future customers for making the Via Murano® experience part of your lives. We absolutely appreciate your business!